I consider this to be a really ill-conceived decision that was poorly thought through. 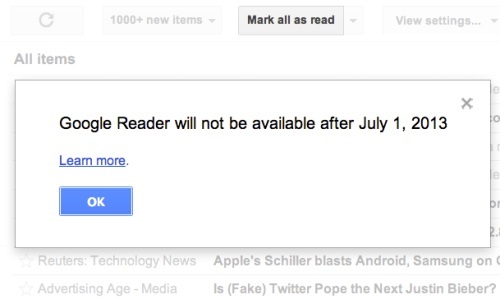 The fact is, Google Reader has not been given that much publicity or attention over the last few years. Not much effort has gone into promoting it. Nonetheless, it maintains a significant following. It does its job well and has not needed to be constantly modified to be accepted by users, unlike Google+ and other services struggling for mainstream acceptance. Also, tell your friends and associates, online and in person, about how they can benefit from using RSS reading services to conveniently subscribe to and follow their favourite blogs and news websites.